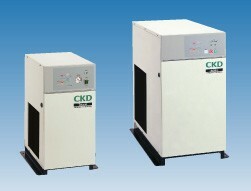 New refrigerant R-407C to prevent ozone destruction is used in CKD refrigerating type dryer GX3000/5000 Series. Introducitn the all new GX Series! The stainless steel plate heat exchanger provides outstanding corrosion-resistant, preventing refrigerant leaks and rust formation. A stainless steel vessel is used, and refrigerant piping is configured from spiral fin tubing free of brazed sections. Standard specifications, max. working pressure 1.6MPa, are provided for all models. Drainage is forcibly ejected by the dryer's air pressure, leaving pipes unclogged. Reliability is greatly improved using a direct-acting solenoid valve. Drainage discharge time is controlled based on inlet air temperature. Air loss is prevented. Solenoid valve operating frequently drops with inlet air temperature, extending solenoid volve life. Unbelievable price on Refrigerating Type Air Dryer, CKD in Puchong (Malaysia) company Grandco Engineering, Sdn Bhd.